A Yardie Lobo in GTA III. The Yardie Lobo (known simply as the Yardie in Grand Theft Auto Advance) is a gang car that appears in Grand Theft Auto III, Grand Theft Auto Advance, and Grand Theft Auto: Liberty City Stories. As its name implies, the vehicle is driven by Uptown Yardies gang members within their territories. The Yardie Lobo is a lowrider with functional hydraulic suspensions, leopard skin seats and sporty rims, as well as a pair of pink fuzzy dice hung from the rear-view mirror, and red interior door panels. It also appears with only a red body color and a yellow soft top in GTA III and GTA Liberty City Stories, or a green body with a yellow top in GTA Advance. The vehicle resembles a fifth generation Chevrolet Impala and the taillights seem closer to a 1965 Impala. Like other sedan and station wagon-based gang cars in the GTA Liberty City Stories, the game's Lobo also gains a sport car-like engine sound, implying it is a high-performance car. 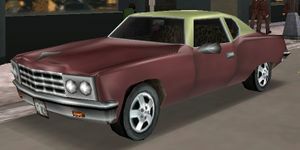 The Lobo earns the distinction of being the only vehicle with functional hydraulic suspensions in GTA III, similar to the Haitians-driven Voodoo in Grand Theft Auto: Vice City. Introduced in GTA III, the Lobo is also the first vehicle in the GTA series with hydraulic suspension. Similar to the Cartel Cruiser, Forelli Exsess, and Sindacco Argento, it does not have a non-gang variant. A Yardie Lobo in GTA III (Rear quarter view). A Yardie in GTA Advance. A Yardie Lobo in GTA Liberty City Stories (Rear quarter view). The Lobo's performance is described as average, possessing slightly above average speed, moderate steering sensitivity but a susceptibility to tailspins during high speed corning. Having only two doors, the Lobo can only seat two. The suspension set-up is mediocre, but when the height-rasing hydraulics are activated, the Lobo is prone to flipping over at the slightest bump. In GTA III, the Yardie Lobo has a unique horn, a high-pitched variant of the Cheetah's horn. However, it is only heard when an NPC pedestrian is driving the Lobo. However, the same-sounding horn would be passed on to the Admiral, a vehicle without hydraulics in GTA Vice City. Seen driven around Newport, Staunton Island, Liberty City. The Lobo can also be encountered in Belleville Park on some occasions. This page was last modified on 26 June 2015, at 01:01.